If the mistake wasn’t caught until after the parsha was finished, how did he stretch the ת? Unless it was done in small steps — with panim chadashos. הרי זה פסול משום כתיבה שלא כסדרן. What about other psrshiyos one may have of his . Can the be used? Does one have to recall tefillin if they were sold with this sofer's parshiyos? I had a parsha from this exact sofer (please confirm last name ends with the letter n) in my office in australia a little while ago which had the word bveisecha written twice. It was in the shel rosh. I sent it back. I remember the mistake well because I showed it to people and discussed it with the sofer as well since i had paid for computer check (I re computer checked all his tefillin after that). As strange as it sounds, I'm fairly certain it is this exact parsha. 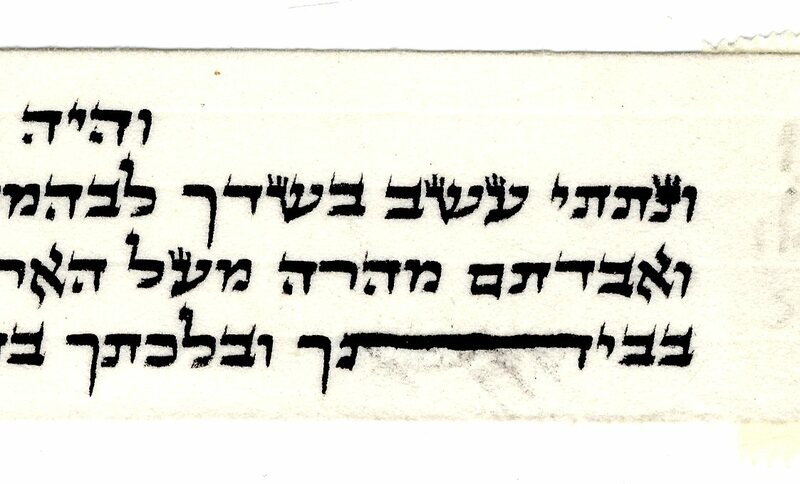 Pls confirm the sofers name ends with an n and the parsha is dated more than 6 months old? I also remember some of the letters on the parsha were a bit fuzzy. This is very serious if this is the case. If you use mishmeres stam we can have them run the pasha in database. If not please find copy. Question for rabbi wiener. התבלבל now what as Eli asked. No, it did not go through mishmeres. They came supposedly computer checked and when I found the error doing my manual hgoha, I sent the parsha back and computer checked the others locally. אם אתה רומז וחושב שזה לא כסדרן את אתה טועה. מי אמר לך שזה אותה פרשיה. ולפעמים אני קולט את הטעות באותו הזמן.ועוצר ומוחק ומתקן. So I guess you should definitely not be using the parsha. אז זה שלא כסדרן !! 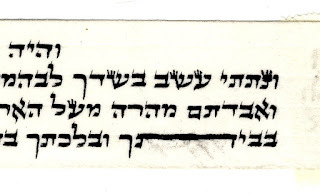 "So i guess you should definitely not be usung this parsha"
We might need to go back to kabala betokef all the more fore cheaper parshios.This sofer obviously doesn't know the halacha-his kabala is from 10 or more years ago.